Mr. Machida carefully planned his successful finale in Washington D.C. to coincide with the anniversary of True Father’s own rally at Washington Monument, the second of two major rallies celebrating the United States’ bicentennial in 1976, and where True Father spoke on “America and God’s Will”. In D.C., Mr. Machida was welcomed by local Unificationists, clergy and activists for conflict resolution including Dr. Ki Hoon Kim, Continental Chair of the Family Federation for World Peace and Unification (FFWPU) North America, Dr. Michael Balcomb, President of FFWPU USA, Mr. Richard deSena, President of the Universal Peace Federation (UPF) USA, Masaru Masuda, representing Japan and the first Unificationist in Japan, Dr. Michael Jenkins, Chairman Emeritus of the American Clergy Leadership Conference (ACLC), Rev. 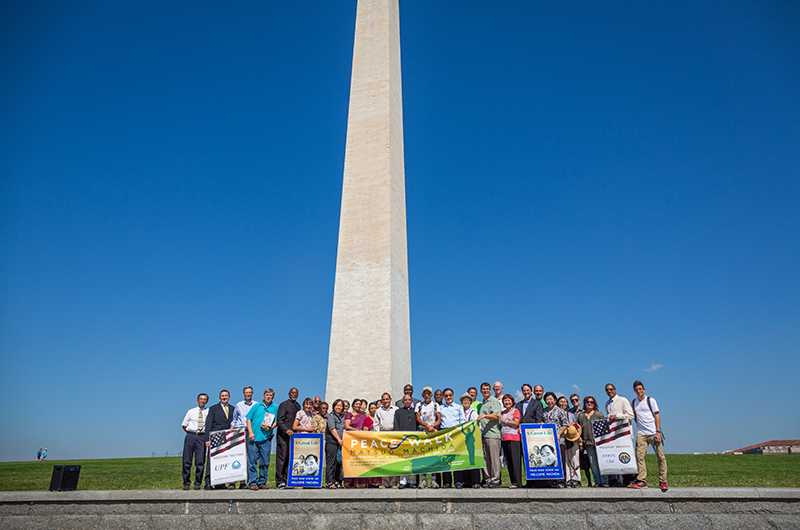 George Augustus Stallings, National Co-Chair of ACLC, Dr. Zulfigar Kazmi, President of Commonground USA, and Mr. Mike Ghouse, Executive Director of the American Muslim Institute, among others. 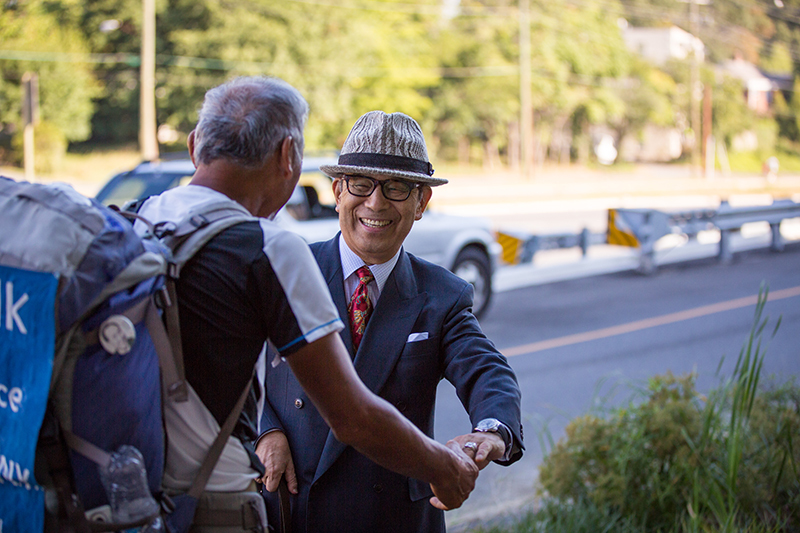 One day prior, Mr. Machida had walked through Fairfax, Virginia to meet Mayor R. Scott Silverthorne, clergy and reporters. He was welcomed at City Hall by clergy of several faiths, including Rev. Earnest Patton, District Director of FFWPU District 1, and Fr. Adrien Bayo of Richmond, Virginia, and the mayor gave him a ceremonial pin of the seal of Fairfax. 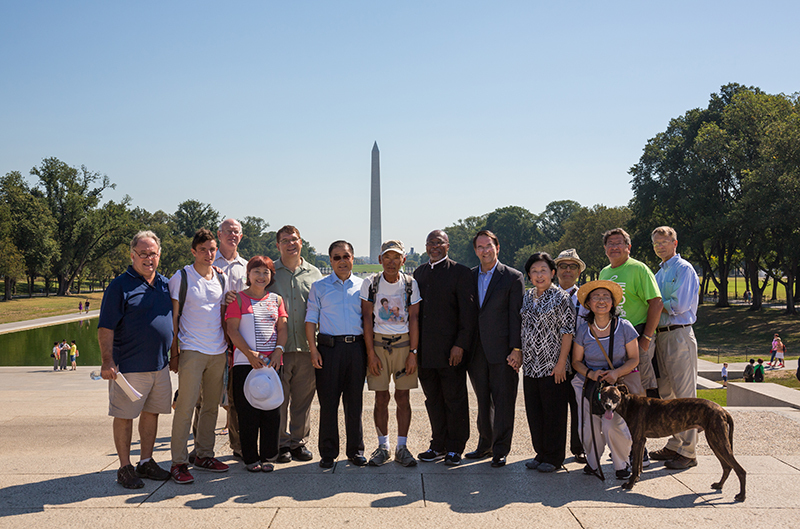 Then on Friday, September 18, Mr. Machida and his welcoming party met at the Lincoln Memorial, less than a mile from the Washington Monument. When they arrived to the monument, Mr. Machida knelt and prayed quietly by himself. Then, in a final meeting, everyone exchanged words and messages, including Mr. Machida, Mr. Masuda and Dr. Kim. 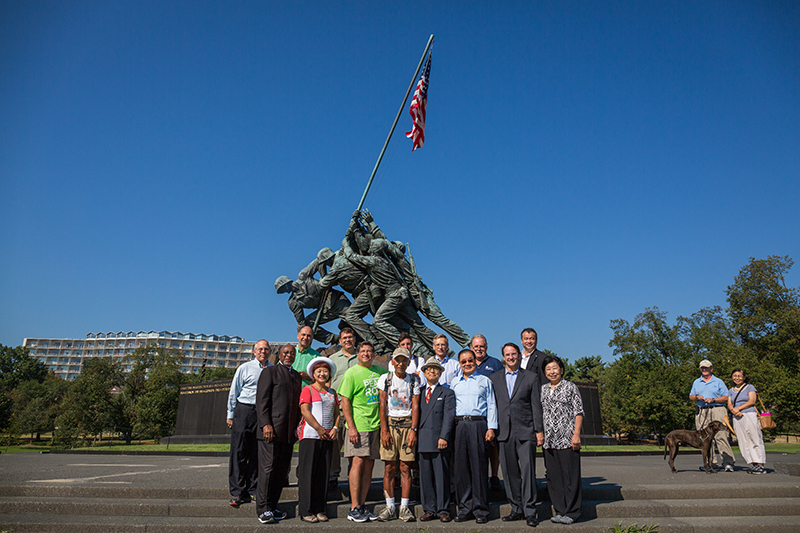 Dr. Kim shared with the group that True Mother recognizes Mr. Machida’s walk as part of the 2015 Peace Road. Over the weekend, Mr. Machida rode up to New York City, where he visited Madison Square Garden and the United Nations. As his stop in Washington, D.C. represented his offering to America, his stop at the United Nations symbolized his global offering. Kodan members and several Unificationists from New York and New Jersey joined him there, and Rev. Hiroshi Inose, Director of Kodan and Itinerant Worker (IW) to America, said a prayer. On Saturday evening, Mr. Machida was welcomed to the Clifton Family Church in New Jersey, where he gave a long talk in Japanese, translated into English via radio. Local Unificationists were moved to hear him passionately describe his last couple of months. The next day, Mr. Machida returned, at long last, home to Japan. Over these past 90 days, his message was that America needs to return to God and to its spiritual roots. His incredible journey has been an inspiration for Unificationists around the country, many of whom met up with him as he passed through their local towns, taking him to lunch or offering a place to rest. Always ready to talk about his quest and the message behind it, Mr. Machida was engaged by curious passersby and even local officials and mayors. In several towns he was received at City Hall. This is the second time that Machida is making this trek. 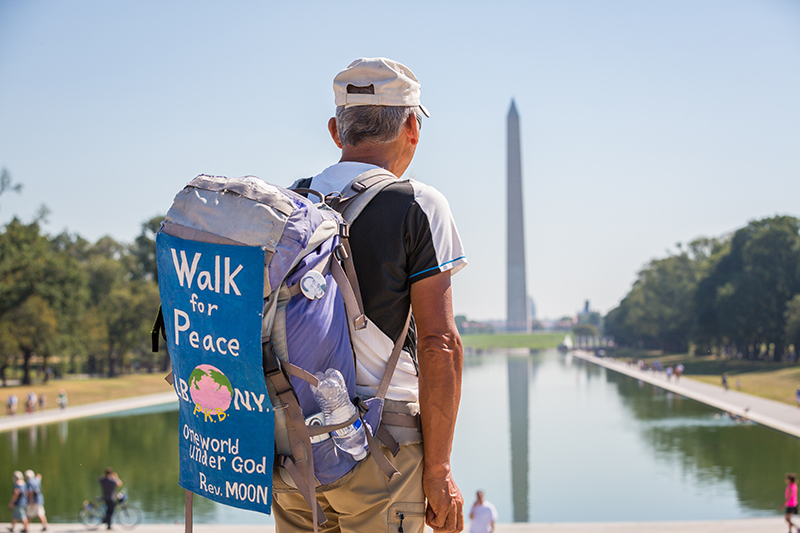 In 2004, he says he received an inspiration from God that he should walk from San Francisco to Washington D.C. in order to bring awareness to True Father’s unjust imprisonment. 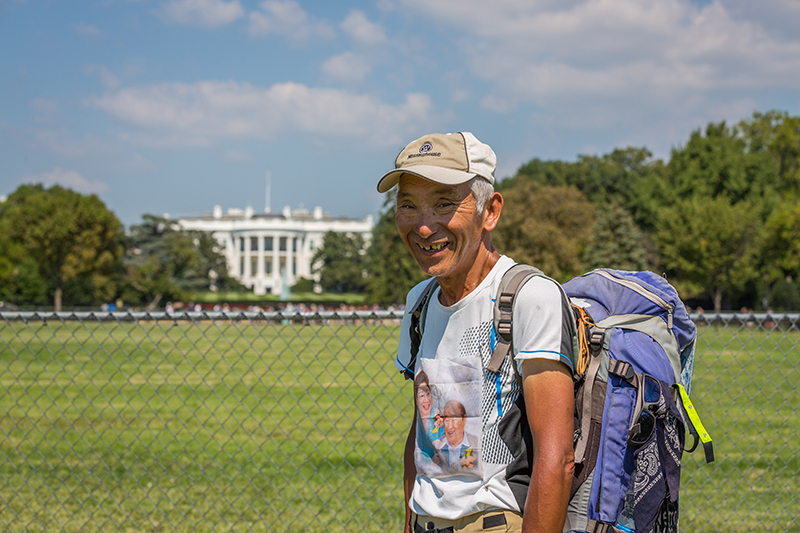 Breaking his own record, this year Mr. Machida walked 14 hours a day in order to make his deadline to arrive in Washington D.C. by September 18. 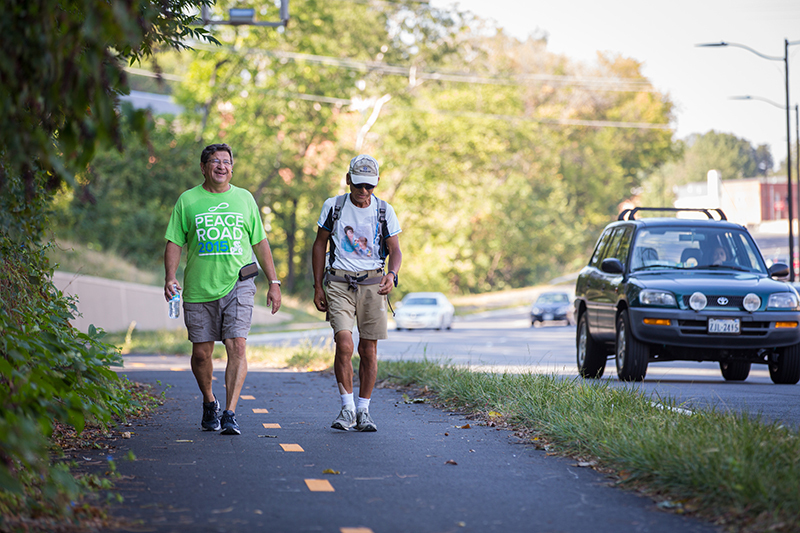 Read all about Mr. Machida’s journey on the Peace Walk blog. Congratulations, Mr. Machida, and God Bless!